German Bundeswehr buys EMILY 2200 fuel cell systems; total order amount: approx. EUR 0.86 million. Systems already delivered in December 2017. The order represents repeat business for SFC Energy following the successful deployment of the fuel cell by German Bundeswehr in December 2011. 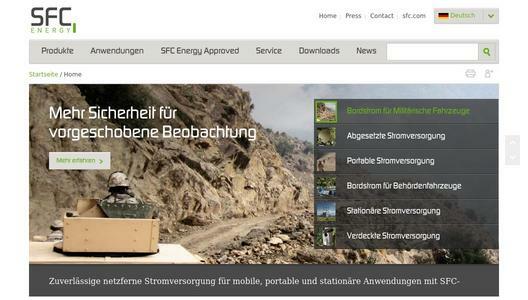 SFC Energy AG (F3C:DE, ISIN: DE0007568578), a leading provider of hybrid power solutions to the stationary and mobile power generation markets, announces receipt of an order of the Bundeswehr’s Federal Office for Equipment, Information Technologies and Usage (BAAINBw) for supplying off-grid power to devices on board of defense vehicles and to soldiers in the field. The order has a volume of approx. EUR 0.86 million and is the second order to SFC Energy by the BAAINBw following the EUR 3.6 million order received on December 12, 2017. The EMILY 2200 system was specifically developed to meet demanding requirements in defense applications. It fully complies with military standards.